Americas gateway to the universe. Leading the world in preparing and launching missions to Earth and beyond.Oct. 6, 2000 John F. Kennedy Space Center Spaceport Newshttp://www-pao.ksc.nasa.gov/kscpao/snews/snewstoc.htmVol. 39, No. 20 Pages 3-4  Spaceport Newsgoes inside the Mobile Command Center. Page 6  Waste Trackers Team noted for quality work. Page 2  Jan Heuser wins the Director  s Award for her work on SERPL funding. InsidePage 5  CFC, Open House and other special events. SPECIAL EDITIONcoming Oct. 20:100th Shuttle Mission launchA look at how we  ve gotten here and where we  re going in the coming century.KSC to remotely manage HETE-2 launchSuper Safety Day on the wayThe HETE-2 spacecraft, completely assembled and mounted to the third stage of the Pegasus rocket, is being processed by KSC at Vandenburg Air Force Base for a launch Oct. 7 at the Kwajalein Missile Range.Mark your calendars for Oct. 18, as Kennedy Space Center (KSC) and the Cape Canaveral Air Force Station (CCAFS) 45th Space Wing will suspend normal operations for the third time in order to focus completely on safety and health. All normal work activities with the exception of mandatory services such as fire, security, cafeterias, and buses will be suspended to allow all possible personnel to attend Super Safety and Health Day activities. This years theme is Safety and Health ... A Working Relationship and the event will involve a number of health and safety related activities that include a keynote speaker, panel discussions, displays, vendors, presentation of Accident Prevention Awards, astronaut safety-related visits and a technical paper session. The events at the KSC Training Auditorium will be broadcast Centerwide on NASA TV. Also on Oct. 18, from 8:00 a.m. to 5:30 p.m., some 140 vendors will be available for employees to visit on Oct. 18 at the Headquarters Building, the Vehicle Assembly Building parking lot, in the LC-39 Area and Hangar F at CCAFS. A technical paper session will be held on Oct. 19, 8 a.m. to 4:30 p.m., at the Debus Conference Facility at the KSC Visitor Complex. The KSC Super Safety and Health Day 2000 Web site can be viewed at http://163.205.38.12/ SuperSafetyY2K\supersafetyY2K\ default.htm The special Web site has links to many current on-line health and safety resources. For the first time, NASAs Expendable Launch Vehicle Services at Kennedy Space Center will remotely manage a rocket launch. The High-Energy Transient Explorer 2 (HETE-2), a satellite that will detect gamma-ray bursts, is set to launch Oct. 7 at 1:45 a.m. EDT on a Pegasus vehicle from the Kwajalein Missile Range in the South Pacific. Because the Kwajalein site does not have a launch vehicle monitoring system necessary for the level of management required by NASA, a system for remotely monitoring the launch vehicle will be used at KSC. Three separate communication paths have been set up for voice and data transmission as a fail-safe measure. This is a great opportunity to demonstrate that we can launch anytime, anywhere, which is one of the programs strategic goals, said Chuck Dovale, NASA ELV launch manager. Remote monitoring has been used previously by the KSC team on certain secondary aspects of managing launches from Vandenberg Air Force Base. That monitoring helped prove to program leaders that remote launch monitoring was a viable alternative in certain situations, Dovale said. The Kwajalein site was chosen for the launch because of the launchs required inclination, less than 5 degrees with of goal of less than 2 degrees. On orbit, HETE-2 will locate mysterious gamma-ray bursts and other explosive cosmic phenomena. The gamma-ray bursts represent the greatest release of energy other than the Big Bang, and scientists are still trying to understand what causes them. SPACEPORT NEWS Oct. 6, 2000 Page 2 Heuser wins Directors Award for SERPLNew facility fostered by dedication A. Q.You have been honored with the 2000 KSC Directors Award for your work in establishing a partnership with the State of Florida and developing and carrying out a successful strategy to fund and construct the Space Experiment Research and Processing Laboratory (SERPL). How did you go about fostering the partnership and creating the strategy? It was truly a team effort involving people not only from KSC directorates but also from the contractor, academic, local, regional and state communities. Success of any partnership depends largely upon whether or not it is able to meet the needs of the partners. This has been a driving principle in defining the SERPL strategy and partnership. Both the Center Director and I have made significant investment in sharing our vision with others and helping them to realize the excitement of Space Station, the importance of space to Florida, the criticality of diversification to KSC and the Space Program, and the contribution of SERPL to realizing a bright and healthy future. Why is partnering with the State so important for KSC?Q. A. Q.Partnering with the State represents a significant opportunity to enhance commercial and academic access to the spaceport and the International Space Station. It facilitates collaboration among Floridas best academic, commercial and government talents to retain a competitive team and provide a vital resource for international and commercial space customers. KSC traditionally has been the worlds premier launch site with operations capability second to none. However, global competition is increasing, and to retain United States pre-eminence requires diversification. To meet this challenge, KSC is redefining itself as a Spaceport Technology Center recognized not only for launch operations but also for research and technology development. To accelerate this cultural change and attain recognition in the research and development world, NASA KSC needs the involvement of world-class universities. Partnering with the State, particularly its universities, facilitates such involvement and is critical to the diversification and health of the Center and United States aerospace activities. What is the SERPL? It is the primary Gateway to the International Space Station. The SERPL will be a world-class laboratory with all the capability and systems necessary to safely host International Space Station experiment processing as well as associated biological and life sciences research. In partnership with the Spaceport Florida Authority and other State agencies, NASA is designing the facility and the State will fund and perform construction. Plans are for the completed SERPL to be comanaged by NASA and the Florida Space Research Institute, using the University of Florida as its lead academic institution. Why is it key to moving KSC toward the Spaceport Technology Center vision? SERPL provides critical attributes for research and technology development. The new laboratory will be the product of close teamwork between NASA and the State of Florida. Research will be jointly conducted by NASA and a university-led consortium open to public and private institutions. Each partners scientific and research intellectual resources will enhance the total knowledge base and expertise, and provide a solid foundation for a new science, research, and technology development community in the area.A. A. Q.How will the SERPL help in developing the planned Space Commerce Park?Q. A.This unique laboratory will be the magnet facility for a planned 400-acre Space Commerce Park at KSC. The park will provide an ideal location for businesses and research groups with a need for close proximity to the Space Centers launch and landing facilities and technical capabilities. SERPL customers become potential Park residents as ISS spinoff applications and commercial involvement mature. For example, an international partner may invest in an additional processing facility or a commercial customer may build a research laboratory. In addition, part of the joint KSCState effort includes construction of a roadway to provide 24-hour access through KSC for the first time. Such access and infrastructure are essential to attract potential Space Commerce Park tenants. 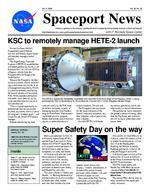 EDITORS NOTE: Jan Heuser leads the Spaceport Technology Business Development Office at KSC. For the past year, she has served as program manager of the Space Experiment Research and Processing Laboratory (SERPL). Prior to coming to KSC in 1981, she worked at Goddard Space Flight Center and as a program manager at NASA Headquarters. Originally from Kentucky, Heuser is a graduate of the University of Kentucky. She and her husband Robert live in Merritt Island and have two children.Jan Heuser is congratulated by KSC Director Roy Bridges. Page 4SPACEPORT NEWSOct. 6, 2000 a redness to new level of excellence in responseCommunication in the immediate vicinity of the MCC is available through a public address system speaker on top of the vehicle. Video cameras provide for monitoring the vicinity of the center and can be used for recording activity. The Brute also features creature comforts like a bathroom, a small refrigerator, a coffee maker and a kitchen sink to assist staff who spend long hours at the center. A pullout awning allows personnel to stand in the shade just outside the MCC. The great thing is that with the Mobile Command Center, you can pull up, stop and go to work. Its incredibly efficient and speeds our response time, said Roger Scheidt, Senior Emergency Management Analyst with RPI. The MCC has already responded to a chemical spills at the Spaceport and supported two launches. The Brute replaces Old Blue, or the old Mobile Command Post, that was rigged on Center out of a blue pickup truck with an aging camper attached. The camper had been used for about 12 years and the pickup truck carrying it was replaced several years ago. Setting the camper up for a response took much time because equipment could not be left onboard. We didnt have much space in there and there was no way to fully equip it for all that we needed, but it did give us mobility, which is important in emergency situations, Scheidt said. The new MCC is being purchased for about $235,000 by SGS with Joint Base Operations Support Contract savings. It was built by Lynch Diversified Vehicles of Burlington, Wis. The design of The Brute was chosen after Emergency Preparedness investigated other mobile command centers used by various response organizations across the state. Its design is nearly identical to a center used by the Orlando Police. A lot of thought went into designing and equipping this vehicle. Were going to be using it for a long time and we wanted to get things right, Scheidt said.The new Mobile Command Center (MCC), at far left, has been nicknamed  The Brute  by Emergency Preparedness staff. The specially equipped 37-foot emergency response vehicle is a significant contrast to  Old Blue,  the camper-equipped pickup truck pictured below. The team formerly used Old Blue when a mobile field command center was needed. At left, the team practice inside the MCC for an emergency scenario. Pictured from left are Robert ZiBerna, Roger Scheidt and Charles Street. The group is also shown below left in the MCC  s conference room. Below Charles Street uses a phone outside The Brute. John F. Kennedy Space Center Managing editor. . . . . . . . . . . . . . . . . Bruce Buckingham Editor. . . . . . . . . . . . . . . . . . . . . . . . . . Kathy Hagood Editorial support provided by InDyne Inc. Writers Group. NASA at KSC is located on the Internet at http://www.ksc.nasa.govUSGPO: 633-096/00042Spaceport News Spaceport News is an official publication of the Kennedy Space Center and is published on alternate Fridays by the Public Affairs Office in the interest of KSC civil service and contractor employees. Contributions are welcome and should be submitted two weeks before publication to the Media Services Branch, XAE-1. E-mail submissions can be sent to Katharine.Hagood-1@ksc.nasa.gov Page 6SPACEPORT NEWS Oct. 6, 2000Space pioneers Andy Pickett and George Skurla were recognized at the National Space Club Florida Committees Lifetime Achievement Award luncheon on Sept. 14. Andrew Pickett started launching missiles from Cape Canaveral nearly a half century ago as part of the original Redstone launch team. In the mid -70s, he served as Deputy Shuttle Project Director at Kennedy Space Center (KSC), preparing KSC for the Shuttle era and in 1983 he was promoted to Associate Director of KSC. As Kennedy Space Center (KSC) celebrates Quality Month during October, a quality-driven team to learn from and take pride in is the Waste Trackers Team. The environmental partnership was formed out of a Center initiative to open dialogue on environmental issues among NASA, the U.S. Air Forces 45thSpace Wing, KSC contractors and the State of Florida. These environmental issues are crucial to KSCs overall effectiveness in providing safety and health first, the number one guiding principle of the Center, as well as environmental leadership. The team has realized many significant accomplishments in the short time they have been together, including their Plastic Blast Media Recycling effort. Corrosion Control operations at KSC/Cape Canaveral Air Force Station (CCAFS) now use a closedloop recycling system, which eliminates personnel exposure and minimizes environmental impacts. Before this closed-loop recycling system was put into place, spent plastic blast media (PBM) was the third largest hazardous waste stream at KSC. About 54.7 metric tons was produced each year. Suppliers were located that could supply the media, as well as recycle the resulting spent plastic media. The problem was solved after a statement of work was developed for a performance-based contract to recycle the spent PBM into safe recycled products. The statement of work and regulatory rationale was partnered through KSC/CCAFS and the Florida Department of Environmental Protection (FDEP), ensuring consistent agreement and endorsement of FDEP. The end result is a cost savings of $62,825 per year. Another important accomplishment of the team is the United Space Alliance(USA)/CHS Hazardous Waste Tracking System. This pilot program is a joint venture between CHS Waste Management and USA, set up to electronically manage all hazardous and non-regulated waste. All of USAs 90-day site inventories can be updated and viewed online. Weekly inspection sheets can be printed out with exact time/date the site was inspected. A Technical Response Package can be downloaded from CHSs current database, and a Waste Support request can be sent electronically. The new process integrates the waste pickup manifest, which is provided to the site contact at time of pickup. This customer friendly approach eliminates redundancy and improves accuracy of data in the monthly reports. This system has an estimated cost savings for USA and CHS of approximately $11,000 per year. Other successful projects include Bulging Drum Investigation, Holiday Inspection Criteria, Tank Training Course and Disaster Preparedness. All of these issues were resolved in a win-win situation for the parties involved, said Pat Lynn, NASA Environmental Program Office representative on the team. The Waste Trackers Team has a knack for discussing issues and resolving them before they become problems, said team facilitator Denise Coleman. The group has become a team with a shared interest not only in work, but each other, Coleman said. It has truly been a pleasure watching this group in action. Formed in March of 1999, the teams membership includes representatives from NASA, Air Force 45 CES/CEV, Florida Department of Environmental Protection, Boeing, United Space Alliance, the U.S. Environmental Protection Agency, Dynacs, Lockheed Martin, the Brevard County branch of the Office of Natural Resources Management, and Comprehensive Health Services/Joint-Base Operations Support Contractor. For more information on the teams activities, the KSC teaming effort in general, you can contact Doug Younger at 867-4556.Waste Trackers improve environmentThe Waste Trackers Team members pictured above have worked together to achieve a number of quality improvements at KSC and CCAFS.Space leaders recognizedGeorge Skurla joined the Grumman Aircraft Corp. as an apprentice engineer in 1944. In 1965, he was named Director of Operations for Grumman at KSC where he oversaw the final assembly, test and pre-launch checkout of the Apollo Lunar Module. In 1974, Skurla was elected President and Chief Operating Officer of Grumman Aerospace. Center Director Roy Bridges was the keynote speaker at the awards luncheon in Cocoa Beach.